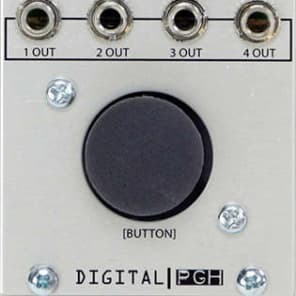 You and/or your modular plays 6 different games, creates fun, musically useful sequences with 4 outputs. Create your own musical masterpiece, a melody that defines a generation. 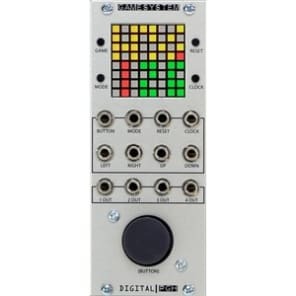 Music Programmer is a classic 32 step CV and gate sequencer that is programmed with the joystick or auto-generated using control voltages. Sequences can vary in length from 1 to 32 steps and can be played in forward, reverse, pendulum, or random order. CV output is quantized to 1 volt per octave to keep the resulting patterns well tempered. Impress your friends by applying all that geometry you learned in school. Inspired by the paper by Godfried Toussaint, the Euclidean Rhythms game is an auto-generating gate pattern sequencer that organizes complexity. 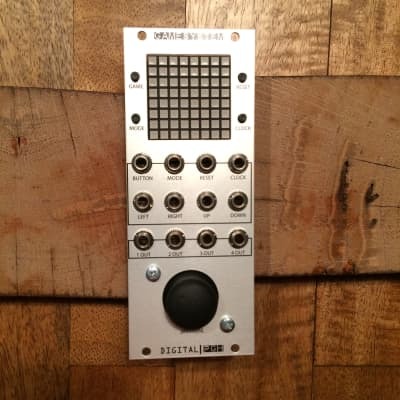 Mathematically, the Euclidean Rhythms sequencer works to evenly space the number of active beats over the length of the sequence. Musically, the Euclidean Rhythms effortlessly creates organic patterns steeped in both Western and non-Western musical philosophies. 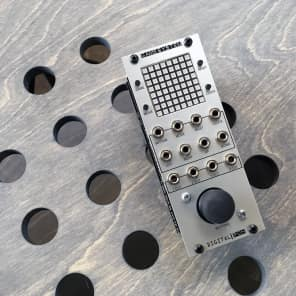 Add a bit of CV control to create sequences that evolve with the incoming voltages, and suddenly math never sounded so good. Auto mode button plays the game automatically. Joystick CV inputs control Left, right, up and down direction, button press or mode.